My Silver Award, a journey that I will treasure forever, all started with a simple act at the end of the school year. After my first experience, I never could get the idea out of my head that kids need essential school supplies to not only learn, but to thrive in this growing world. When I saw kids throwing perfectly good school supplies, including backpacks, in the trash at the end of the school year, I knew that I needed to take action. This was the beginning of Re-use, Re-teach, Re-learn — a program intended for student success and keeping supplies out of the garbage can. I knew the perfect mentor for me, a devoted and passionate 6th grade teacher, and my math teacher. I had all the tools I needed, I was thriving. At the end of the school year, my Mom and I went on a ³shopping² trip to local King Soopers and Safeway grocery stores in search of apple boxes to collect gently used school supplies during the last few weeks of school. 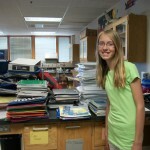 My 6th grade year, we collected stacks of supplies, taking up a classroom wall, all sorted out by type. The supplies went to less privileged schools in our community, the counseling office at our school, and some shipped off to Mweruka Junior School in Uganda with a non-profit organization, Unite Our World (Learn more at Unite Our World.org). Creating a worldwide impact helped me realize that no goal is too big, and that if you have a dream, you can achieve your dream. This experience helped me realize how great Girl Scouts really is. My 7th grade year went even better, with all of the quirks worked out, we were able to have an even more successful program. My previous mentor left for Australia for a year, coming back in December 2012, so I had to find a new mentor, my 7th grade science teacher. With the help of my friends collecting boxes and boxes of school supplies at lunch, and with the help of my teacher, I was yet another step toward achieving my goal. 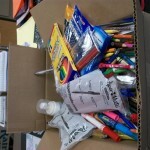 The school supplies we collected my 7th grade year went to a local school in need, and again, some stayed at the school counseling office for students in need. This year, my 8th grade year, I will be handing off Re-use, Re-teach, Re-learn to a program at my school dedicated to the environment, while also helping students. Taking initiative helped me gain confidence in myself, and also helped me gain confidence in the world. Thank you Ms. Lang, Mrs. Gaunce, my friends, Mom, Dad, Stephanie, and thank you Girl Scouts for helping me on my path to success. At the beginning of August, Girl Scouts of Colorado officially kicked off the Women of Distinction season by holding private receptions to welcome this year’s honorees. The Colorado Springs reception was held at The Cliff House at Pikes Peak on Monday, Aug. 6th, and also included the announcement of a new honor we have started for women under the age of 40, Women to Watch. 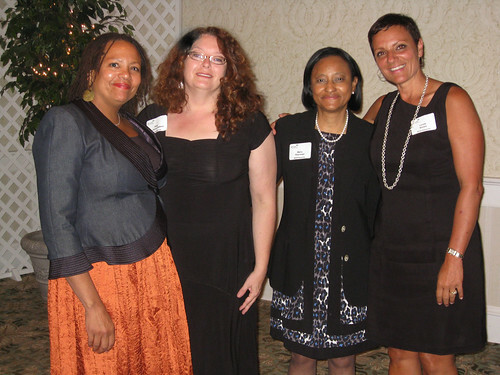 Denver held their reception on Wednesday, Aug. 8th, at the home of 1997 Woman of Distinction Barb Grogan. 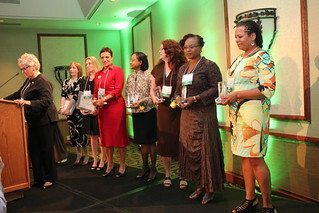 Girl Scouts of Colorado honors top women leaders in our community as Girl Scout Women of Distinction. These women have reached remarkable levels of achievement as business, philanthropic, government, education and community leaders. They are committed to making the world a better place for the girls of today and tomorrow. They donate their time, talents and experience to Girl Scouting and also support Girl Scouts financially. Read more about this year’s honorees on our blog here: Colorado Springs and Denver. Public events to recognize these women will be held later this fall. The Colorado Springs event is Sept. 13th, while the Denver event is Oct. 23rd . Both dinner events will feature food and drink items inspired by the world-famous Girl Scout Cookies. Also premiering at both events will be a feature film on healthy living created by Colorado Springs Girl Scout Troop 3810. Get a sneak peek of the video filming below. To help out with fire relief efforts, Colorado Springs Girl Scout Troop 3810 donated Girl Scout Cookies to Care and Share, a local food bank. Recent headlines “The Waldo Canyon Fire has destroyed 346 homes and damaged more than two dozen others. Two people have been confirmed dead…” KRDO news said the destroyed homes in one neighborhood were worth $110 million and there were at least 22 burglaries and 16 car break-ins of victims at hotels. With all that horrible news swirling around don’t you think that we deserve some of that good old-fashioned happy news? Well, what about people thanking the firefighters that are trying to stop the thing that’s causing the bad news? Following are some things that you can do, something that was just amazing and a project I did. Drive around and you’ll see signs everywhere in Colorado Springs – from windows to stop signs and even highway overpasses – ranging from a few scrawled words on cardboard to machine-made and even signs that stretch from one lamp-post to another saying “THANK YOU!” Why don’t you try making some signs of gratitude for the firefighters too? For inspiration check this out – amazing! Recently, Couture Cupcakes made 65 dozen cupcakes for the firefighters, 911 dispatchers, Care and Share, all animal shelters taking evacuee pets for free and every organization which is helping with the fire for free, as a big thank you by “the Cupcake Lady” and owner, Joni McCoy. She does a lot of charity and loves giving back to the community and when her friends were evacuated and her sister almost lost her home, this was a no brainer – but she needed lots of help to do it. Jodi designed Girl Scouts 100th Anniversary Cupcakes and generously gave them free to any troop that asked for them in March. My and my sister’s troop had a party with those yummy cupcakes so we felt it was only right for our troops to give back and help her and do something for the firefighters and volunteers. I joined a group of volunteers who came together through Facebook or news stories about the effort. We shaped fondant into hats, axes, hoses and fire hydrants – all designed by Joni – to be put on red or yellow iced cupcakes. It was fun BUT the best part though was coming with 74 cupcakes in my mom’s car’s trunk. We drove to five different fire stations and gave them each a box of cupcakes. The first one we went to Station 6, which had firefighters from Golden covering for the local firefighters that were usually there, but at the moment were up at the fire. They were so welcoming and showed us around their truck and let us try the sound blocking head phones and the different hoses as well as gave us a fire safety lecture about our home. Then we went over to the Station No. 2, the Old North End’s fire station that covers my home and school. It had firefighters from Arvada No. 8 also covering for the local crew that was usually there but at the moment were up at the fire. They were working a 72 hour shift so they had a kitchen, a room with fluffy recliners positioned around a TV, an exercise room with even more TVs, and a big dorm like room with beds for when they wanted to sleep. I also got a tour of their firetruck except this one was only six months old and it is one of the newest firetrucks in all of Colorado. These trucks are expensive so that is why fire stations loan them out and help fight fires in other places. Next we went to the other station downtown, No. 1, which had the local crew that had been in the thick of the fire on Tuesday. They explained how heartbreaking it was to have to decide which houses to save or not because of the intensity and speed of the fire. Also, how there were so many firefighters posted in a line along Hwy. 24 to beat back any flames that tried to come down the hill there. They showed us their firetruck and were especially grateful for the cupcakes. Then we went to fire station 16 at the foot of Cheyenne Mountain that was manned by a crew from Stratmoor Hills while the locals were fighting the fire. This one had one of those poles from the bedrooms to the downstairs and three firefighters slid down it for us. They also turned on their sirens – it was really loud! Coincidentally, my school principal was there with her granddaughter delivering brownies! Then I went to Cheyenne Mountain High School that was a Red Cross shelter for evacuees and their pets. We delivered our cupcakes to the dedicated volunteers who were caring for the evacuated pets. On the ground were chalk drawings. One especially caught my eye: it said “Wait for the Miracle.” Then we headed inside the gym to see if we could be of help. There were rows and rows of cots with a few bags underneath. I saw a girl sitting on a cot with a dog crying. I felt really bad for her – I hope her house didn’t burn down. The deliveries took about six hours because the firefighters were so friendly, grateful and excited to show us their stations. When all our deliveries were done, I learned that my evacuated aunt and her family could go back to their house. I am so happy the fire is going away! Show the firefighters your thanks! Make cards and baked goods, give a hug (they fought hard and take it personally they couldn’t save all the homes), or show your support during the shift change (7 a.m. or 7 p.m.) and join the crowds at Fontanero and 31st Street. We are proud of all the efforts local Girl Scouts have done to help with the relief efforts around the Waldo Canyon Fire. As a reminder, Girl Scouts CANNOT raise money for fire relief efforts. They can collect ITEM donations, such as food, water, clothing, etc. Or make a monetary donation from a Girl Scout troop treasury or personal funds to a relief agency such as the Red Cross or the Salvation Army. Girl Scouts are also encouraged to volunteer at organizations looking for helping hands. There are many fire relief activities happening in the Colorado Springs/Pikes Peak area where Girl Scouts can offer their assistance (see list below). These activities change minute by minute, so please check with the organization first to find out the needs. We are also posting relief agency updates on our Pikes Peak Regional Facebook Page. If you have further questions, please let us know. Thank you for supporting your community! Yesterday at the All Breed Rescue & Training, located at 20 Mount View Lane, Suite C, in Colorado Springs, I helped with some of the 57 animals temporarily housed there. Seven cats, three dogs, one gecko and one bunny were evacuees, and the rest came from the Humane Society to make room there for more evacuated pets. Just like anyone of any age can do, I walked, fed and loved the dogs and cats. I interviewed some of the staff while there was a rare moment of rest (the dogs where napping) and asked what they needed. “We need volunteers of all ages, but we also need animal food, blankets, towels, treats and toys for the cats and bunnies. We already have enough for the dogs, but we are especially low on things for the bunny. All he has is cardboard as a toy,” one staff member said. They also need people to take sheets and towels to the laundromat and wash food / water bowls. Phew! Those dogs are a lot of work! We gave them kongs, splashed in wading pools, took walks and cooled them down with ice placed in front of fans. One puppy named Madeline was so happy she was doing back flips! At least Madeline was happy. Many dogs “cried” and hunkered down in their kennels – like the dogs I walked, named Midori and Samurai. Now imagine those sad, lonely dogs at night – even worse! But you can help! A maximum of 10 people (any age) can stay the night (a troop?) and comfort the dogs. So if you want to assist in fire relief, try feeding, walking, playing and possibly spending the night with evacuee pets. Dog walking shifts are 6 a.m., noon, 5 p.m., with play and naptime in between. Call 719-264-6460 and then go to 20 Mount View Lane, Suite C. I hope to see you there! Note: All Breed Rescue & Training fosters out pets (in close relationship with the Humane Society) and doesn’t normally house the pets. They now have 57 animals and could take up to 120, so they need lots of help. Speak with Office Manager Sara Simon, or any of the other helpful staff on what they currently need. Email: info.abrt@gmail.com; Website: www.HaveANiceDog.org. I live 6 miles from the Waldo Canyon Fire – we are not in danger at this time and decided rather than sitting around watching the news we needed to do something! I bet you have all heard about the Waldo Canyon Fire by Colorado Springs and all the countless people working to stop it. But do you know that Girl Scouts are involved? Yesterday Colorado Springs Girl Scouts from Troops 1947 and 863 collected water and Gatorade to give to the fire fighters. I went up with my fellow Girl Scouts from Troop 863 and delivered the days donations at Coronado High School where a buffet and lots and lots of coolers full of drinks were set out for the fire men and women. Also, there was a Q&A with Mayor Bach and others. Today we are going to walk and play with dogs at the All Breed Animal Rescue Shelter housing evacuees pets. I really hope this fire will end soon, but I’m also glad I got to help. 1) View of fire first night from my house downtown: fire is orange glow center right (above Fine Arts Center Parking lot) and Pikes Peak is to left. 3) In front of supply stash – we didn’t bring all of that! If your Girl Scouts or troop is interested in helping out with similar efforts, look for requests for help on the Waldo Canyon Fire Group on Facebook. Also, many of the local media outlets covering the fire are including information on how you can help. We’ve also heard Colorado Springs’ Care and Share is looking for non-perishable food items, especially looking for snack bars, cereal, crackers, butter and jelly. Please keep in mind that Girl Scouts can’t raise money for other organizations or causes, but can donate money from troop treasuries or personal accounts. If you have five minutes, check out this video created by Caryn Kessinger Co-Leader of Troop 3810 from CO Springs. She used video and photos to capture all the amazing moments of this trip of a lifetime. Flat Juliette, four girls and 2 leaders attended the ceremony at Epcot in Florida. Please join us on this journey!